I noticed something annoying on my iPhone yesterday, a shadowy spot on all the pictures I took. The shadowy spot would get larger when I zoomed in and smaller when I zoomed out, but nevertheless always present. From that, I concluded it wasn't something wrong with my phone display but rather the lens. I tried cleaning the lens, you know, there could have been a smudge. But that was futile. I know what you're thinking, it's just a smudge, not the end of the world. But I use my iPhone as my principle camera, so I thought it was worth having the Geniuses at Apple check it out. So that's what I did after my first class today. And well, they gave me a new iPhone. Apple has excellent customer service, and no one disputes that. But it is slightly weird to have a new phone. First, it's empty, aside from my contacts. I haven't been home yet, but once I do, it'll be restored from my backup. But for the time being, it's empty. What do I mean empty? Well, no songs, no pictures, no notes, no apps, games and utilities alike. My calendar is empty, my email isn't synced. And those are some of the things I've come to appreciate about the iPhone. It was my agenda, plus more. So that's different. But all that can be remedied when I get home. I don't know exactly what I'm trying to say. I guess maybe that I've always been fond of my scars and the same way I wouldn't want the scars on me gone, I wouldn't want the scars on my phone gone. And also, I feel materialistic for caring but I guess I'm not too materialistic because I'm only mildly, if any, upset that my old phone is gone. If this were my scars that were gone, I would be extremely downcast right now, maybe borderline hysterical. 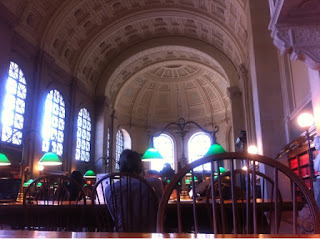 Post Script: I'm at Boston Public Library (BPL) right now, because well, it was only down the street from the Apple store and when will I make the time to study here, again? And the BPL really is beautiful. It puts Mugar to shame. Actually, many libraries put Mugar to shame. I really love high ceilings. I'm more of a dabbler.